Grand Opening of North America’s First Zoroastrian Fire Temple The Bhandara Atash Kadeh (fire temple) is a new addition on the site of the vast ZAH grounds on West Airport near the Beltway and is a result of decades of planning and was made possible by the generous donation of Feroze and Shernaz Bhandara. inclusive and welcoming spiritual place of worship for all in our community in the hopes that NonZoroastrian family members can share our faith and spiritual beliefs thus carrying the Zoroastrian faith onward to the next generation. He concluded by turning over ownership of the Bhandara Atash Kadeh building to the ZAH. Vada Dasturji spoke on the “Zarathushti Way of Life in Today’s World”, about the survival of the Zarathushti faith in the modern world. Aderbad Tamboli, Rohinton Deputy, Khushrav Nariman, and others for their support and contributions during construction. The celebrants raised over $100,000 for ongoing operational costs to show their commitment to the ongoing care of the Bhandara Atash Kadeh. MCs for the evening were Mitra Khumbatta and Darius Tamboli. The crowd gave standing ovations to The Children’s Choir, led by Sunday school teacher Vehishta Kaikobad, who performed a Spiritual Song to the tune of “It’s Now or Never” and by musical selections by Chloe and Tayte Choudhury. DJ Gary (Farrokh Firozgary) and the Z-band rocked the dance floor by singing everyone’s favorite tunes and brought the evening to a close. The Zoroastrian Association of Houston was established in 1977 with just over 12 families. In 1998, the Zarathushti Heritage and Cultural Center was built within the 8 acres owned by the ZAH. The Bhandara Atash Kadeh is a standalone, designed by architect Cyrus Rivetna of Chicago is easily recognizable as a Zoroastrian place of worship is located across from the Center and is now ‘must see’ for Zoroastrians, their non-Zoroastrian spouses and children throughout North America. The 7,000 sf building includes a community Prayer Hall, ceremonial rooms and two living quarters to be used for those undertaking their Navroze or first training as priests. Over 25 years experience The keynote speaker, Dr. Aparna Kamat; Special Guest, Judge Juli Mathew and guest, Dr. Heena Thakkar (from right to left) commemorate the start of the conference in a traditional manner by lighting the divo. and learn from each other’s reflection and thoughts as well. Through this activity, attendees were able to play an active role in the dialogue presented by the speakers. At the end of the conference, Keynote Speaker, Dr. Aparna Kamat shared, “All of us have such busy lives, and one thing that I felt was, it is easy to add spirituality into our day to day life without it being a big deal. I thought that was the biggest take home point for everyone.” Another attendee, Dr. Manisha Bawa commented, “I think this topic can help anyone, no matter what their faith is, what their religion is, because spirituality is for everyone and it is to promote our humanity so it can help at any level.” Speaking to the overall experience of the conference, attendee Mrs. Kavita Bhatt stated, “The conference was very inspirational, very motivational to make you want to aim to be better.” The BAPS Women’s Conference was inspired by His Holiness Pramukh Swami Maharaj and encouraged by His Holiness Mahant Swami Maharaj, the current spiritual leader of BAPS Swaminarayan Sanstha. The conference highlights the influential role of women in today’s society and also empowers the younger generations by promoting a healthy dialogue around current topics. Before and after the conference, attendees had the opportunity to network with others from the greater community and share their perspective on the talks of the day. Many in attendance felt inspired by the conference and conveyed their motivation to share the word with their family and friends. Two hours of non-stop, awe inspiring show was enjoyed by more than 350 guests. Entire program was directed and coordinated by academy’s Guru Mr. Prashanta Kumar Behera. Savory Odia and Bengali cuisine served for lunch. Photo courtesy Mrs. Swagatika Nayak, Visit Odissi Academy at www.OdissiAcademy.com, To see performance videos, visit Odissi Academy channel at www.youtube.com/c/odissiacademy. Lord Shiva), Mohana Pallavi (pure dance), Nava Durga (an Abhinaya – dance drama), and Konark Shree (a dance describing use of musical instruments in temples of India) were performed by students of Academy. Students of Odissi Dance Company performed group dances, Nagendra & Mokhya. The star attraction of the day was the duet called “Khamaj Pallavi” by Odissi Academy concluded the event superbly. •Over 30 years of practice in Immigration Law. •Member of the American Immigration Lawyer’s Association since 1989. •Providing representation for Canadian Immigration through our associates in Canada. •Over 16 Languages spoken by the Firm’s staff. Sam Kannappan (left) S. Narayanan, Isaikavi Ramanan, Priya Chandru and Prabhakaran. support for Houston Tamil Studies Chair at the University of Houston. Sam Kannappan welcomed the gathering followed by introduction of the speaker by Ganesh Raghu. Priest Sri Manickka Sundara Bhattar honored the speaker with shawl. K.R. Thiagarajan presented the presadam from Sri Meenakshi Temple. Arumugam Thiruvengadam took video and still pictures. Naa. Ganesan invited the speaker to Houston. Rishi Oberoi has joined Ekal Vidyalaya in Houston as Zonal Development Director. raised over $1 million in four months – a record and double the initial goal. Rish also picked up some useful skills from summers spent behind the cash counter as his father, Ricki Oberoi, owns several franchises of fast food chain Wendy’s. It was an excellent training ground for tangible lessons such as keeping “a cool head with less-than-reasonable customers” to connecting with people. More importantly, he realized that business wasn’t his cup of tea and said as much to his parents. They were understandably taken aback at first, but were always supportive of his decision to carve out his own path. Rish plans to visit a few Ekal schools in India to see for himself how the organization runs 83,000 schools and touches the lives of two million children. He is drawn to Ekal’s concept of not only providing free schooling but also vocational training, digital competence and agricultural education to farmers. As a millennial himself, he’s partial to the Ekal on Wheels – a program that uses mobile buses with computer stations to impart digital skills to children and young adults. During his me-time, Rish enjoys going for music festivals and cheering for the Houston Rockets. He’s also a major history buff and travels to Canada to see his girlfriend Alysha whenever he can. The celebration started with the Holi puja. The Holi fire was lit by Acharya Gaurang Nanavaty. The day ended with a splash, of course! Colors filled the air as they got thrown and smeared in this happy celebration of the advent of spring. Photos by Rajesh Thatte. lunch early in the day. The courtyard was decorated with beautiful strings of colorful pennants. The holi fire was set in the middle of the courtyard. The sound system amped up the joyous mood. Piles of vibrant colors were set up to be distributed to all participants. As if to reward all devotees, the Gods too seemed to shower their love gifting all with a beautiful day – the perfect weather for all to sing, dance, and play with colors to their hearts’ desire! At 1.00 PM, all participants gathered in the courtyard. The celebration started with the Holi puja. In late January, Gitesh Desai received the Pravasi Bharatiya Samman Award for 2019 from President Ram Nath Kovind as External Affairs Minister Sushma Swaraj looks on. accolades; when it was his turn to speak, Gitesh Desai opened with a short lyric “mere dil ke malik, mere dil per haath rakhna; kahin aaj is kushi mein, mera dil rukh na jaye” (Lord, please hold onto my heart lest it stop with all this happiness). Desai thanked the teachings of Mahatma Gandhi, Swami Aurobindo and Vivekananda for instilling in him the values of selflessness, sacrifice and service and to seek truth. staged in Houston as well as other cities in the US and India. Montreal: Sikhs living in Canada have expressed concern over secularism bill tabled by Quebec government, which if passed, would prohibit wearing of religious symbols in public sector. President of World Sikh Organization of Canada, Mukhbir Singh told TOI on Friday “we are deeply disappointed that the Coalition Avenir Québec government has introduced legislation banning the wearing of religious clothing and symbols in Quebec. “ “The proposed legislation is a solution to a problem that does not exist- there is no evidence to suggest that individuals wearing items of religious clothing are negatively impacting anyone in society”. Sikhs living in Canada have mainly objected on the section of bill that outlaws wearing of religious symbols by public workers . ban and the Sikh articles of faith is not optional for Sikhs and a ban on these articles of faith was, in effect, a ban on Sikhs in positions of authority. “We fear that this ban will have a trickle-down effect into the private sector and young Sikhs who are born and raised in Quebec will find it even more difficult to find jobs in the province” he said. He pointed out that the term “religious symbols” remained undefined in the law- leaving it unclear as to how particular items of jewelry or clothing would be classified and who will make that determination. He also added that the practicing Sikhs, both men and women, wear the Sikh articles of faith such as the turban at all times as reminders of the principles of equality, service and spirituality. ing of her film, India’s Daughter. Ms. Udwin introduced the audience to Think Equal, her initiative to teach empathy and equality to children in the formative, developmental years. Ms. Udwin ended her inspirational speech with a call to action, urging the audience to shine the light on domestic violence in our community. Daya is aiming to raise $400,000 for the gala. To donate, please go to https://www.dayahouston.org/ what-your-dollars-can-do. Daya empowers south Asian survivors who are trying to break the cycle of domestic and sexual violence and reclaim their lives. Houston to get her MBA in 1976, became a CPA and started her own accounting practice in 1985, which she ran until recently Bal and Kamna owned a gas station on Voss and the Katy Freeway for 15 years, though he continued to work as Senior Mechanical Consulting engineer at the Wood Group. 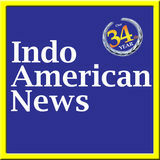 She was the president of the Indo American Charity Foundation and later of Club 24, both non-profits and spent many hours working on community projects. She was active in military support groups and army family readiness support groups. Kamna worked diligently to get the home repaired after it was flooded out from Hurricane Harvey and then moved back into in March 2018. Besides her sons and Bal, Kamna is survived by her grand daughter Aubrey, 4. A pooja is planned on the thervan (13th day) at the Sharma residence. of a Sanjay Leela Bhansali costume drama but it is yet to be seen how this inspiration translates on screen. Overall, Kalank is a film with quite a lot of characters and it looks like they will all have a pivotal part in taking the story forward. Madhuri Dixit plays Bahaar Beg um in the film and the role was initially supposed to be played by Sridevi. After her untimely demise in February 2018, Madhuri Dixit stepped in. Directed by Abhishek Varman, Kalank releases on April 17. Anjalee Khemlani, Managing Editor, ROI-NJ as moderator; Dr. Naveen Mehrotra, Founder & President of the SKN Foundation; Anouska Cheddie, Co-Chair of Chhaya CDC; Sadaf Jaffer, Mayor of Montgomery Township (New Jersey); and Kavita Mehra, Executive Director of Sakhi for South Asian Women. 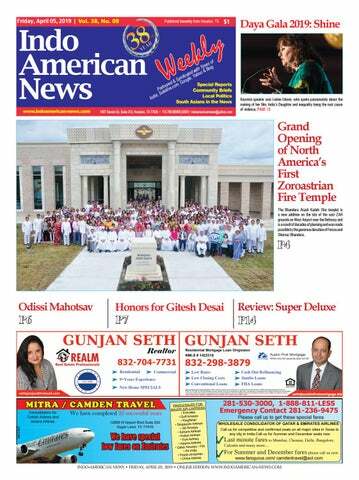 Leading South Asian weekly based in Houston, Texas.